A new report says the worldwide clean energy sector grew 30% from 2009 to $243 billion worth of finance and investment in technologies like wind, solar, biofuel, and geothermal. 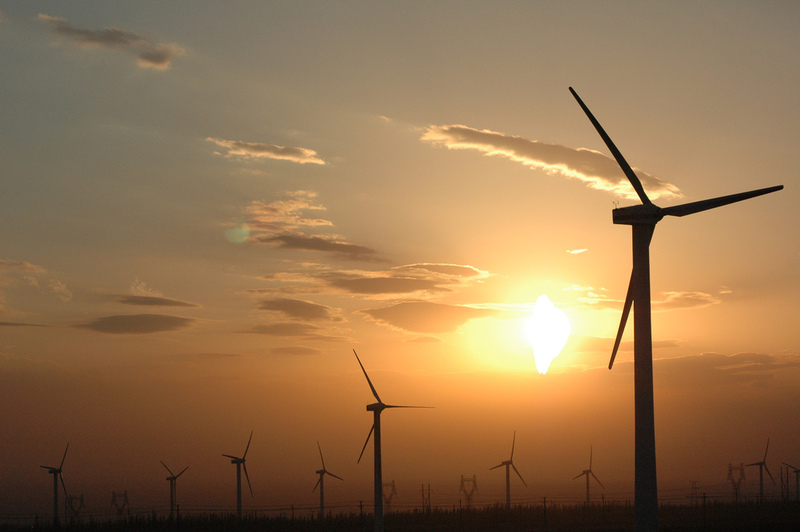 Add renewable energy to the list of industries in which China is now coming out on top of the U.S. While China is still home to thousands of pollution-spewing factories, it’s also now churning out wind turbines and solar panels at a world-record pace. According to The Pew Charitable Trusts’ just-released Who’s Winning the Clean Energy Race 2010 report–the country’s private investment in clean energy soared in 2010, increasing by 39% from the previous year to $54.4 billion in funding. It’s an impressive number, but clean energy investment isn’t lagging elsewhere, either. According to the report, the worldwide clean energy sector grew 30% from 2009 to $243 billion worth of finance and investment in technologies like wind, solar, biofuel, and geothermal. “The sector is marked by pretty explosive growth,” says Phyllis Cuttino, Program Director of the Pew Clean Energy Program. Asia is clearly the region to watch. In 2010, clean energy investment increased 33% over 2009 to $82.8 billion. In 2009, the region surpassed the Americas for the first time, and in 2010, investment grew faster than in Europe. The European region is still the leader for clean energy finance this year, with $94.4 billion in investments (mostly helped along by investments in small scale distributed capacity projects like rooftop solar panels), but Asia is quickly catching up. From a national standpoint, the top three countries are China, Germany and the U.S., in that order. Again, Asia slipped past its competitors in recent years. The U.S. used to lead the sector until 2009, when China displaced it. This year, Germany beat the U.S., and China took the top spot. The reason? “National policies really matter. If you don’t have one like in the U.S., it matters,” says Cuttino. by 2020. For comparision, the U.S. currently has .6 gigawatts of solar and 33 gigawatts of wind. “China has an aggressive renewable energy target that investors have flooded in to help them meet,” explains Cuttino. The U.S. is lagging in this arena, lacking a comprehensive renewable energy policy and continuing to offer government cash to fossil fuel-based energy sources. But all isn’t lost domestically. 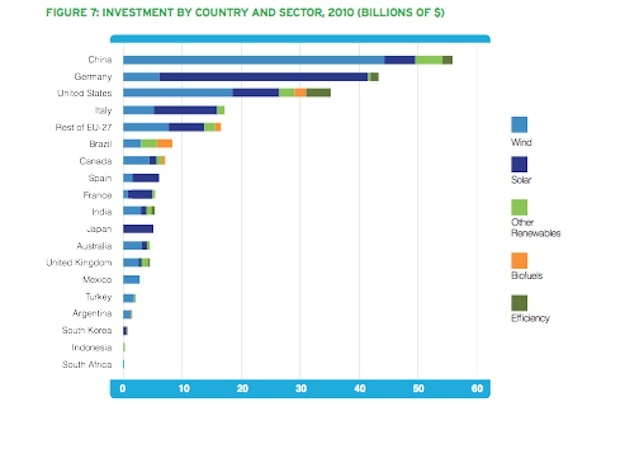 Clean energy investments did rise 51% between 2009 and 2010 to $34 billion. The fact that that was only enough to give the U.S. third place shows just how rapidly the clean energy sector is growing. And that’s good news for everyone.